The River Thames Alliance (RTA) could face mass resignations at a critical meeting if proposals to change its unaccountable governance structure are not agreed at the forthcoming AGM on 4th September 2018. Currently RTA members have no say in the appointment of the Alliance’s directors. In January 2017 Danylo Kurpil, the senior of two directors of District Enforcement Limited, became a director of the RTA. Three of RTA’s directors have resigned since 2015 and only one of the original directors, Michael Shefras, is still in post. The RTA was incorporated as a Company Limited by Guarantee on 20th April 2015. 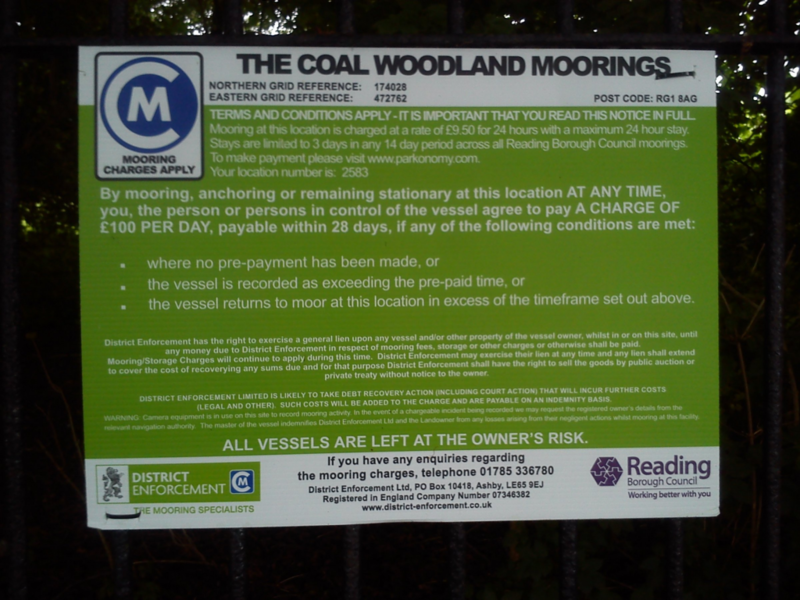 District Enforcement is a parking enforcement company that is now being used by riparian local authorities on the Thames to impose draconian ‘Civil Contract’ mooring charges of £100 per day. Many boaters feel that Mr Kurpil’s appointment to the RTA Board is a clear conflict of interest. Article 17.2 the RTA’s Articles of Association allows the RTA to authorise such conflicts of interest that would otherwise breach the provisions regarding directors’ conflicts of interest in Section 175 of the Companies Act 2006. In addition, Article 17.9 of the RTA’s Articles states that a director is not required to account for any profit made from a conflict of interest that is authorised. This structure would appear to give District Enforcement an unacceptable level of influence over enforcement on the Thames and enable Mr Kurpil to gain significant wealth from enforcement against boaters. It is clear that these enforcement activities are primarily targeted at Bargee Travellers, who typically need to stay on a mooring longer than 24 hours. The Public Right of Navigation, codified in Section 79(2) of the Thames Conservancy Act 1932, entitles boats to anchor, moor or remain stationary for a reasonable time in the ordinary course of navigation. ‘Reasonable’ cannot be determined in advance but must be determined taking into account all the circumstances: see Moore v British Waterways Board  EWCA Civ 73. The imposition of a £100 daily charge thus violates the Public Right of Navigation. The RTA is opposed to the interests of itinerant liveaboard boaters on the Thames; it believes that Bargee Travellers should live on permanent moorings off the main line of the waterway as a “solution to unlawful on-line residential moorings” and refers to “the whole problem of itinerant moorers”. Many RTA members, such as local authorities, have expressed concern at the lack of transparency in the RTA’s Memorandum and Articles. and were especially concerned about the process for director election and the role of directors. Following pressure from members it had been agreed at the 2016 AGM on 26th July that the directors would go away and revise this and other governance issues. It became clear at a General Meeting of the RTA on 19th April 2018 that the revision had not been carried out. The April 2018 meeting was also set to agree the annual reports for the past two years and approve a business plan. Many dissatisfied members have not paid their subscriptions and the RTA may have to spend its reserves or go into debt to meet its liabilities. The RTA was founded in 2003 and became a Company Limited by Guarantee in 2016. RTA members include many local authorities; utility companies like Thames Water; boat clubs; marinas; boating and waterway businesses; private individuals and some boating organisations. At the start of 2016 the RTA had around 120 paid-up members. The NBTA is not a member. The RTA’s Thames Waterways Plan 2015 – 2021 includes a section on navigation and moorings with the aim “To develop a Thames-wide Moorings strategy that will resolve the problems created by unauthorised boats occupying recreational and public moorings”. The RTA also states that it aims to “resolve much of the unlawful on line mooring difficulties currently being experienced by many authorities”. The RTA 2016 newsletter boasted that “Much more work has been undertaken by RTA Members to overcome the unlawful moorings problem. Great success in some areas too has led to prosecutions and the removal of unsightly and dangerous craft”. Most of these boats were people’s homes. It is clear that the RTA has been instrumental in facilitating the increased persecution of Bargee Travellers on the Thames. The RTA also initiated the All Party Parliamentary Group (APPG) on the River Thames which first met on 12th April 2016. 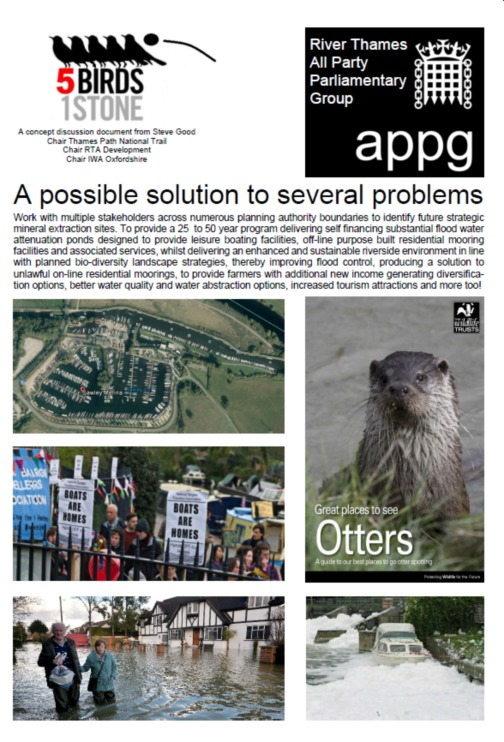 The APPG included discussion of “5 Birds, 1 Stone”, a proposal by an RTA director that claims to solve flood control problems while “producing a solution to unlawful on-line residential moorings” and delivering other perceived benefits. 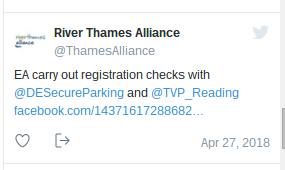 In an example of the growing influence of District Enforcement and the increasingly unhealthy relationship between it, the RTA and the Environment Agency, on 27th April 2018 the RTA tweeted “EA carry out registration checks with @DESecureParking and @TVP_Reading”. The RTA AGM will take place in the evening of 4th September 2018 at the Henley Rowing Museum. Many Bargee Travellers, especially in the Reading area, have been subjected to District Enforcement £100 per day mooring charges, issued only by post, that are increased to £160 if they remain unpaid for more than a few days. No notices are placed on boats. It is thus impossible for Bargee Travellers, who lack regular access to post, to pay the reduced rate of £60 within 14 days, even assuming they can afford it and are sufficiently intimidated to pay up. The NBTA has challenged Reading Borough Council’s use of these enforcement methods and is supporting boaters to use the Council’s complaints process and the District Enforcement appeals process. Some boaters have received County Court judgements for non-payment of these excessive fines and the NBTA is also assisting boaters to challenge these. Reading Borough Council currently has a two-year contract with District Enforcement from May 2017 to April 2019. If you need advice about a District Enforcement or similar mooring charge please contact us. Many boaters have received letters claiming that they have been fined £100 even though no notices were visible or even present where they moored, or used lettering that is too small to read from a moving boat. District Enforcement notices make threats of immediate boat seizure if charges are not paid. This is against the law. If your boat is your home, Articles 6 and 8 of the European Convention on Human Rights entitle you to defend yourself and to have the proportionality of removing your home assessed by an independent court. There is legislation that protects the public in enforcement of private parking penalties: see Section 4 of the Protection of Freedoms Act 2012. The DVLA will only give vehicle keeper details to a parking company if it is a member of a recognised trade association which operates an independent appeals service and sets a maximum penalty charge and where strict conditions of on-site ticketing or service of notice by post have been complied with. If a parking company is in breach, the DVLA will suspend its access to DVLA data. There is no such protection for boaters. District Enforcement operates an appeals process for motorists but it does not advertise an appeals process for mooring. See http://www.district-enforcement.co.uk/appeals.html However the email address for appeals is appeals@district-enforcement.co.uk. The company also trades under the style where2moor. The NBTA advises boaters not to let themselves be bullied by aggressive and threatening tactics to extort charges for alleged overstaying, especially where displayed signs which are a requirement of a civil contract are not clear, not visible from the water and where the imposition of the charge is contrary to the right to moor for a reasonable time contained in the Public Right of Navigation. We advise boaters to keep as much evidence as possible of the mooring and length of time they are moored, such as dated photographs showing inadequate signs. If you do decide to pay these unlawful charges, we recommend conducting all correspondence in writing by email of letter, keeping copies of texts, keeping receipts for all transactions and taking photographs of any signs.